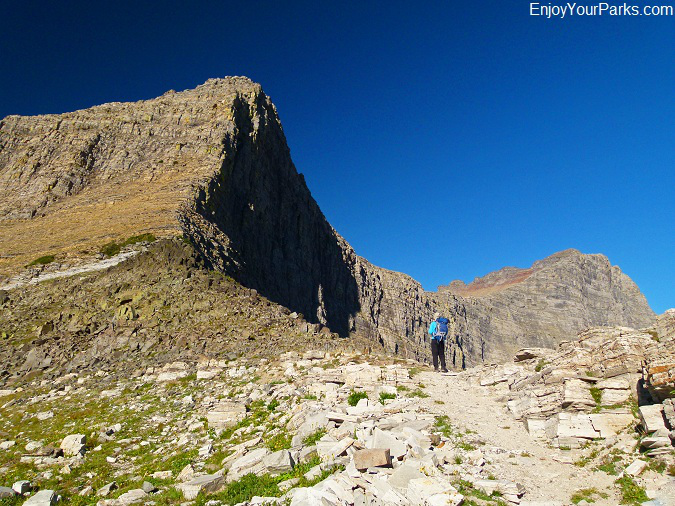 Many of the Glacier National Park hikes are among the most beautiful and scenic in all of North America, and the hike to Triple Divide Pass is no exception. The trailhead to Triple Divide Pass (elevation 7,397 feet) is located in the Cut Bank Area of Glacier National Park, which is a far "less traveled" area than some of the other popular areas of Glacier Park. But even though it is not as heavily visited as other Glacier Park areas, it is still stunningly beautiful and is one of our favorite places in Glacier Park to hike and explore. Triple Divide Pass sits directly underneath the famous Triple Divide Peak. Triple Divide Peak is the only peak in the world where 2 Continental Divides meet at its summit, causing the water to flow into three separate oceans- the Atlantic Ocean, the Pacific Ocean and the Arctic Ocean! This makes the Triple Divide Area a very unique and special place that we are quite confident you'll enjoy. And even though this Glacier Park hike did not make our "top ten favorite hikes in Glacier National Park", it should have. 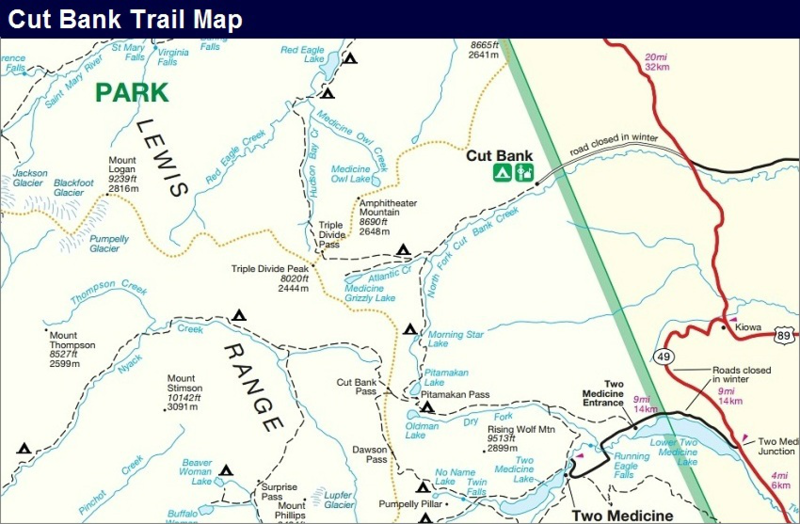 Again, the trailhead to Triple Divide Peak is located in the Cut Bank Area of Glacier National Park, which is found at the end of a 5 mile long gravel road. 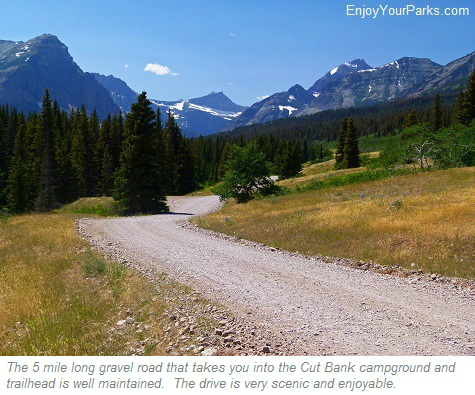 This gravel road is found on the east side of Glacier Park between St. Mary Montana and East Glacier Montana along highway 89. There is a large sign showing you where to turn (west). This five mile gravel road is well maintained, and most cars should not have any problem- provided you drive slow. This gravel road takes you straight west through the middle of the North Cut Bank Valley towards the mountains. The trailhead is located at the end of this gravel road. You'll know you're getting close once you reach the Glacier National Park boundary. About a half a mile beyond the boundary is the Cut Bank Ranger Station, and just beyond the ranger station is the trailhead parking lot. The Cut Bank Campground is directly next to this parking lot. The trailhead to Triple Divide Pass is officially called the Pitamakan Pass Trail, but we simply call it the Cut Bank Trailhead, because it's the trailhead serving several great Glacier Park hikes, such as Morning Star Lake and Medicine Grizzly Lake, as well as Triple Divide Pass. There are usually parking spots available in the small parking area next to the trailhead. The trail to Triple Divide Pass follows North Fork Cut Bank Creek for about 4 miles before it begins its ascent to Triple Divide Pass. Note Razoredge Mountain in the distance. The trail to Triple Divide Pass will begin by taking you through an incredibly gorgeous open meadow that is often teeming with wildflowers. Bad Marriage Mountain dominates the skyline to the south as you begin to hike along the north shore of North Fork Cut Bank Creek. To the west are several mountains that you will hike toward, such as Mount James, Medicine Grizzly Peak, Razoredge Mountain and Triple Divide Peak. 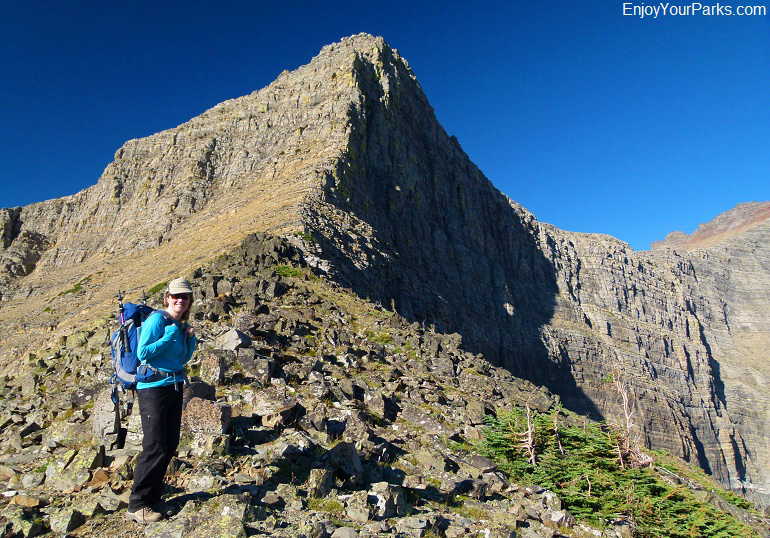 In about 4 miles along this Glacier Park hike you will encounter a junction. The trail to the left will take you to Morning Star Lake, Pitamakan Pass and beyond, whereas the trail to the right continues to take you toward Triple Divide Pass. Take the trail to the right. This Glacier Park trail will then begin a gradual ascent. In about 0.4 miles, you will pass Atlantic Creek backcountry campground. This is an important overnight stopping point for those overnight backpackers on their way to (or from) the Red Eagle Trailhead at St. Mary, which is 23.2 miles from the Cut Bank trailhead. The trail will continue to gradually ascend as it reaches the junction to Medicine Grizzly Lake only about 0.3 miles beyond the Atlantic Creek backcountry campground. Stay to the right and continue the ascent to Triple Divide Pass. Just beyond the junction to Medicine Grizzly Lake, the trail begins to steepen dramatically as it works its way up the north side of the Atlantic Creek Valley. In only 2.4 miles the trail will climb nearly 2,000 vertical feet. (This is where overnight backpackers begin to dislike their packs if they're too heavy!) The views of the valley get more dramatic and breathtaking with each step. The dominant peak to the west, with its permanent snowfield underneath its summit, is Razoredge Mountain. Directly below Razoredge Mountain lies Medicine Grizzly Lake. Across the valley to the south is Medicine Grizzly Peak, where an unnamed lake rests high in a hanging cirque below its north face. With each step you will climb higher and higher in elevation, and the views will become more and more spectacular. 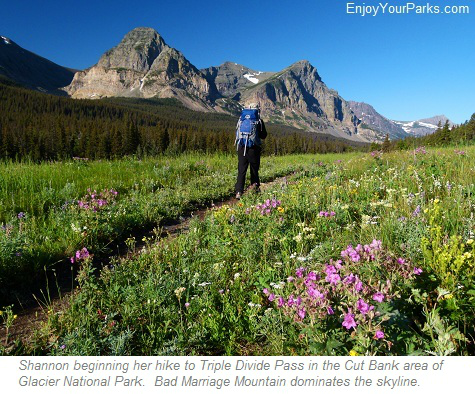 As you gain elevation on this incredible Glacier Park hike, you will begin to really get a good view of Triple Divide Peak to the west. Triple Divide Peak is separated from Razoredge Mountain by a long headwall running north and south known as the Atlantic Creek Headwall. 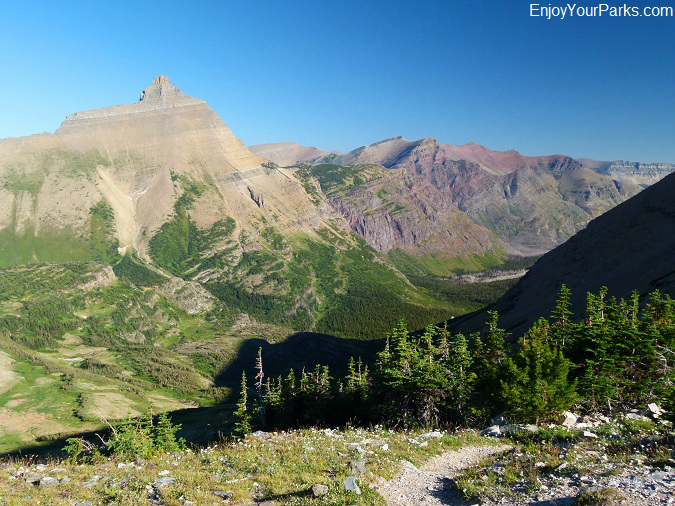 This view of the headwall and Triple Divide Peak will begin to dominate the view as you work your way up this Glacier Park trail to Triple Divide Pass. Shannon hiking along the Triple Divide Pass Trail, Glacier National Park. Shannon standing on Triple Divide Pass with Triple Divide Peak to her left and Norris Mountain to her right. 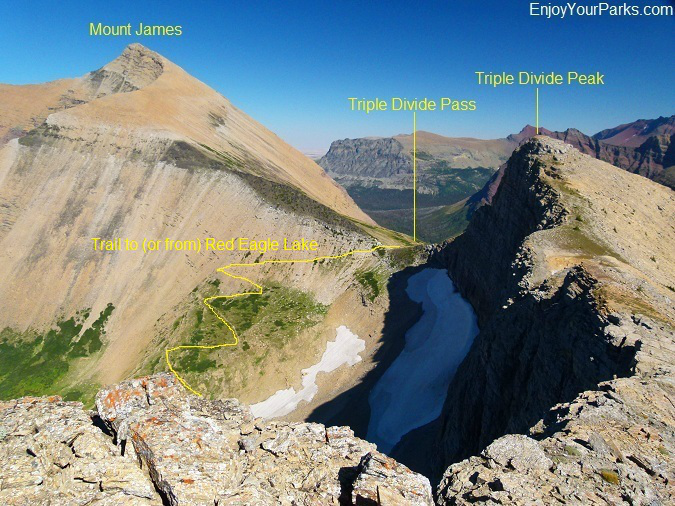 As we previously mentioned, what makes Triple Divide Peak so unusual is that two Continental Divides meet at its summit. This means that if you poured a bucket of water on top of the summit cairn, a third of the water will end up in the Pacific Ocean, a third in the Atlantic Ocean, and a third in the Arctic Ocean. No other peak on earth shares this unique geological situation. This is a view of Hudson Bay Creek Valley (facing north) from Triple Divide Pass in Glacier Park. Red Eagle Lake is at the end of this valley to the right, out of view of this photo. Split Mountain dominates the skyline. Concerning wildlife, keep an eye out for bighorn sheep ewes and lambs because this is where a fair number of them spend their summer. Ewes and lambs usually always go their own way, away from the male bighorns (called rams), during the summer. They will all reunite in the fall as the ewes, lambs and rams migrate out of the high country before the snow gets too deep. By the way, nearly every time we've been on this pass we've seen bighorns, so hopefully they'll be there for you too! This is a view of the Hudson Bay Creek Valley from the summit of Triple Divide Peak in Glacier National Park. The trail winds down the valley from Triple Divide Pass and works its way to Red Eagle Lake, and eventually to the Red Eagle Trailhead at St. Mary, which is 16.2 miles from Triple Divide Pass. 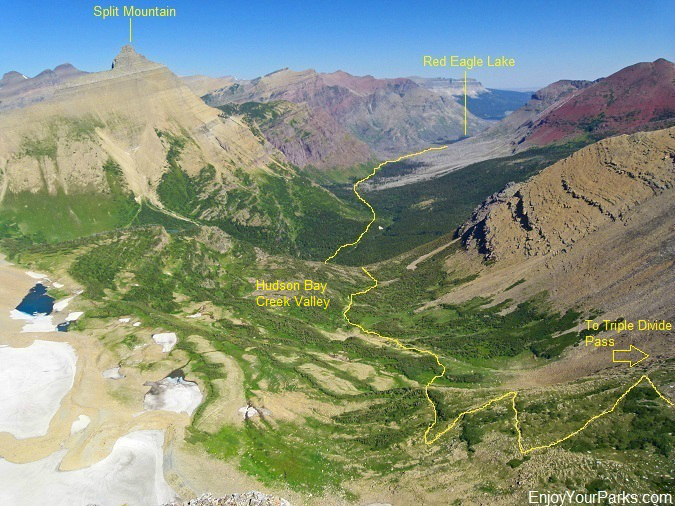 For those of you who are interested in overnight backpacking, from Triple Divide Pass this classic Glacier Park trail then heads abruptly downhill to the north, into the Hudson Bay Creek Valley. Eventually the trail meets up with Red Eagle Creek and then soon after that reaches Red Eagle Lake. The head of Red Eagle Lake is about 7.8 miles from Triple Divide Pass, and is approximately 2,700 vertical feet lower in elevation than the pass. There are two backcountry campgrounds located near the shores of Red Eagle Lake in Glacier National Park, one located at the head of the lake and one located at the foot. These are very important campsites for backpackers who are on a multi-day hike from Cut Bank to St. Mary, or vice versa. Beyond Red Eagle Lake the trail continues to works its way to the Red Eagle Trailhead near St. Mary, which is about 7.5 miles northeast of the foot of Red Eagle Lake. Again, this trailhead is about 23.2 miles from the Cut Bank Trailhead. For more details on the Red Eagle Lake Area, click here. This is a view of the Triple Divide Pass Area from the ridge between Triple Divide Peak and Norris Mountain in Glacier National Park. Note Mount James to the north of the pass, and Triple Divide Peak to the south. This is a view (looking back to the east) of the Atlantic Creek Valley as seen from Triple Divide Peak. The Cut Bank Trailhead is found at the upper left corner of the photo, out of view. The trail to Triple Divide Pass begins at the Cut Bank Trailhead, which is about 7.2 miles from Triple Divide Pass. 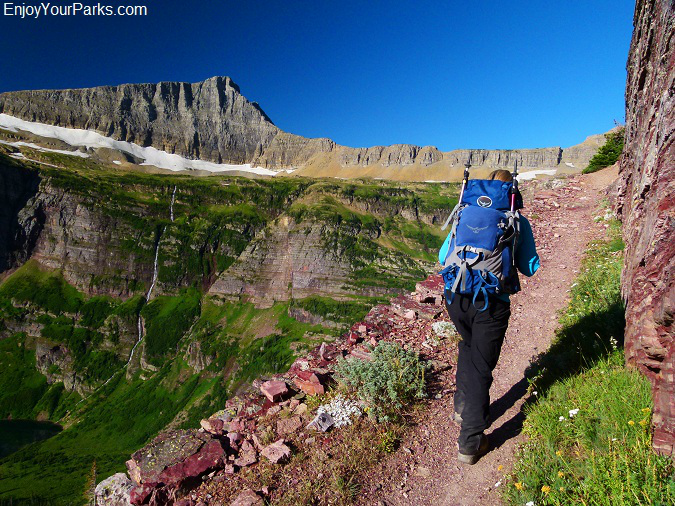 The hike to Triple Divide Pass in the Cut Bank Area of Glacier Park is but one of the many incredibly scenic Glacier National Park hikes, and no matter how many times we make this hike to Triple Divide Pass, we thoroughly enjoy it. The views are wonderful, and the entire hiking experience along this amazing trail is fantastic. 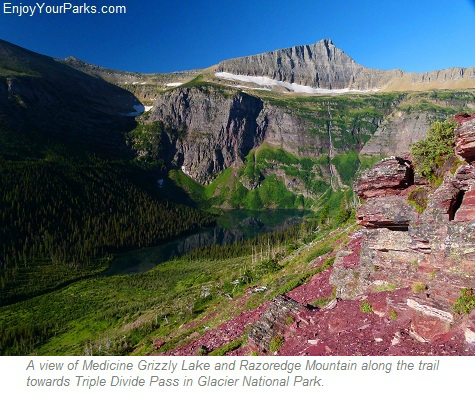 If we could fit more onto our "top ten list of favorite Glacier Park hikes", we'd definitely included the day hike to Triple Divide Pass. Make sure you fill up your water containers (Nalgenes, etc) using your water filter pump at Atlantic Creek. There is no water beyond the Atlantic Creek backcountry campground, and the section of the trail between this campground and the pass is quite steep and tiring. 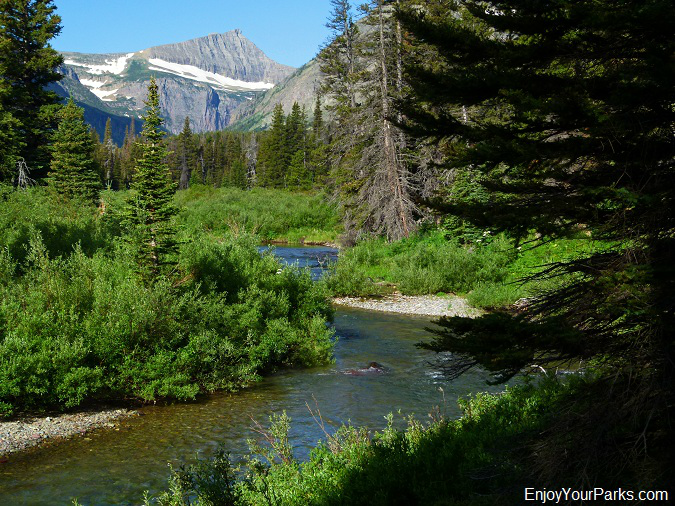 You will enjoy this Glacier Park hike much more if you don't get dehydrated. The sun can really begin to bake the section of the trail between the Atlantic Creek backcountry campground and Triple Divide Pass during the mid-day hours. To avoid "baking", we strongly recommend that you leave for this Glacier Park hike as early as possible- preferably just after dawn. 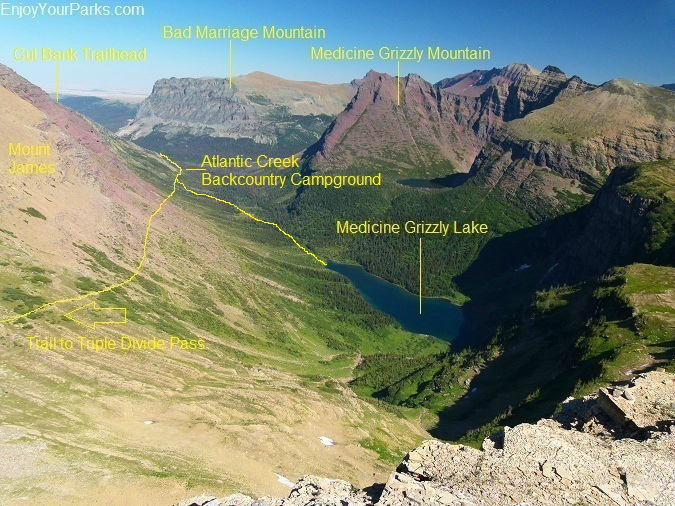 The last two miles of this Glacier Park hike to Triple Divide Pass is quite steep, so make sure you are in reasonably good physical condition before attempting this Glacier Park day hike.